I was trying out Google’s new 200 year search feature, and came across one of Time’s listings. I applaud them for being one of the few providers that don’t charge a subscription or access fee, but I found the page a bit comical. According to their site, they posted the article 80 years ago! That’s 64 years before the first web browser was even created or 68 years before the Netscape navigator was released. 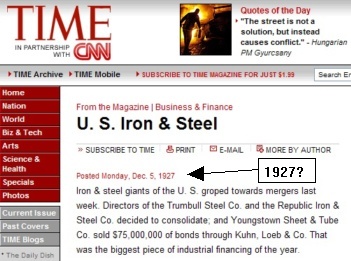 Obviously, the article was written in 1927, but Time’s developers may want to consider changing the text claiming it was posted on their site 67 years before Time even registered their domain name! Next PostNext Google The Mutual Fund?